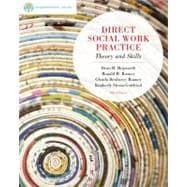 The ninth edition of DIRECT SOCIAL WORK PRACTICE: THEORY AND SKILLS prepares you for effective real-world practice. Packed with case examples, illustrations, and proven learning experiences from the authors as well as other social work practitioners, the book integrates the major theories and skills that direct social work practitioners need to understand and master, earning the book its reputation as the classic source for helping students learn direct practice skills. Furthermore, as part of the Brooks/Cole Empowerment Series, the ninth edition is completely up to date and thoroughly integrates the core competencies and recommended practice behaviors outlined in the 2008 Educational Policy and Accreditation Standards (EPAS) set by the Council on Social Work Education (CSWE). Video demonstrations are available on the optional CourseMate website and ensure student learning experiences are as close to real life as possible.